Heathrow is one of the world’s busiest airports. Operating at almost full capacity it is managing more than 470,000 flight movements per year. Expanding this facility is a major undertaking and our technologies are helping to minimise the disruption with VR audio simulations and advanced project planning. To cope with increasing demand from a growing customer base and the next generation of aircraft the new runway is expected to raise traffic to 740,000 flight movements per year, a throughput of some 130 million passengers. Before we get to work on those numbers there are the complexities of making this happen: politics, planning, project management, public consultations, compulsory purchases, river diversions, noise and air quality impacts. Getting this project off the ground will be an impressive achievement. We began in 2012 with a range of environmental consultancy work, including supporting Heathrow’s proposal to the Airports Commission. While this was important work, in many ways we were just taxiing for the take-off. The scale and complexities of the project are exciting, challenging and daunting in equal measure. To be an integral player in one of the UK’s largest ever infrastructure projects is something we’re very proud of. 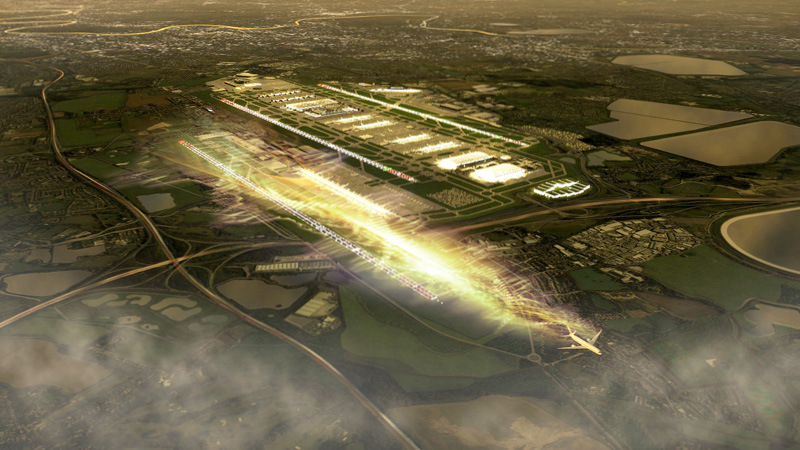 We are working with Heathrow to bring in innovative auralisation and visualisation tools. Technologies we have developed like our Listenin software can be used to inform the impact assessment and support the consultation and engagement exercises, conducting noise modelling through an immersive virtual reality (VR) system. This portable VR system can show stakeholders what a new development, such as an airport or windfarm, will sound like rather than relying on their understanding of decibel figures. The ambition of this work is to reduce the number of people significantly affected by noise. Public greenspace will surround the airport, reducing flood risk, improving air quality, protecting biodiversity and creating enjoyable experiences for the community. Five connecting railway lines and a terminal expansion will seamlessly accommodate 194 destinations served. We are proud to lead the way on these endeavours with a management role on the Integrated Design Team, alongside six other global consultants. The Heathrow expansion is expected to bring £211 billion in economic benefit to Britain. “It is a unique experience working closely with so many prominent consultancies as one collaborative organisation” said Alanna Marsh, associate director of infrastructure. 1. Ready for take-off – as the first construction activity on site, our engineering surveys will assess more than 1,000 individual locations. 2. Cruising altitude – our sustainability and environmental impact assessments will study impacts on noise, air quality, biodiversity and water. 3. The final approach – our landscape design will create new green spaces to benefit both the environment and local stakeholders. 4. Preparing to land – the river and flood engineering, and airfield drainage will necessitate moving major watercourses and creation of new flood plains. 5. Taxiing for arrival – our consultation services will provide the non-statutory and statutory consultation activity, likely to be the UK’s biggest consultation exercise. For more information, please contact toby.gibbs@woodplc.com.